Published Jan 28, 2015 by Addison-Wesley Professional. Part of the LiveLessons series. Getting Started with JavaFX shows you how to create a JavaFX program. You learn about nodes in the JavaFX scene graph and how to structure your first JavaFX program using JavaFX components, which are discussed in more detail in upcoming lessons. You also learn how to use FXML with JavaFX, what FXML is, how it interacts with JavaFX, and why you should use it. The lesson also demonstrates how to re-design the previous JavaFX program with FXML. JavaFX Shapes shows the JavaFX Shape hierarchy and how to create colors and fonts with Text shapes. You learn about CSS styling, how to draw lines, circles, and rectangles, and how to apply linear gradients to rectangular shapes and radial gradients to circular shapes. The lesson demonstrates how to create ellipses, polygons, and polylines, and how to draw arcs, quad curves, and cubic curves. You also learn how to draw custom shapes with Path and PathElement. JavaFX Effects shows the JavaFX Effect hierarchy and how to create drop shadows and inner shadows. You learn about blurring effects, blending and glowing effects, and how to use distant light, point light, and spot light effects in your scene graph. This lesson shows how to input images and adjust colors and how to apply reflection and sepia tone effects. You also learn how to manipulate pixels with DisplacementMap and PerspectiveTransform and how to chain effects together. JavaFX Layout Components shows the JavaFX Region hierarchy and how to use the Pane layout. You learn how to do horizontal layouts with HBox and vertical layouts with VBox, how to use FlowPane and TilePane for node positioning, and how to use GridPane for grid layouts with rows and columns. This lesson shows how to overlay nodes with StackPane and how to position nodes in regions with BorderPane. You also learn how to anchor nodes with AnchorPane and how to use the TextFlow layout with rich text. JavaFX Properties and Bindings introduces JavaFX beans and explains why JavaFX properties are important. The lesson demonstrates how listeners notify you when properties become invalid or have changed. You discover how to create dependencies with property binding and how the binding syntax makes it easier to work with property changes. You also learn how to use unidirectional binding to bind properties in one direction and how to use bidirectional binding to bind properties in both directions. The lesson also shows the APIs for factory binding and fluent binding, and how to create custom bindings. Composite JavaFX Controls shows the complete control hierarchy and how to build UIs with more complex JavaFX controls. You learn how to build menus and how to implement ContextMenus and Tooltips. The lesson demonstrates how to use ColorPicker and DatePicker, ListView and TreeView, TableView and TreeTableView, SplitPane and TabPane, and TitledPane and Accordion. You also learn how to use the ScrollPane and Pagination controls and the HTMLEditor control. JavaFX Animation introduces transitions and explains how they help animate nodes in a scene graph. You learn how to change a node’s opacity over time with FadeTransition, change a shape’s fill color with FillTransition, change a shape’s stroke color with StrokeTransition, and make nodes larger or smaller with ScaleTransition. The lesson shows how to move nodes with TranslateTransition, rotate nodes with RotateTransition, and move nodes along a specified path using PathTransition. You also learn how to pause transitions, play transitions sequentially, and play transitions in parallel. Oracle is encouraging Java developers to migrate from Swing to JavaFX for GUI and rich client development. This video helps developers learn JavaFX and how to apply JavaFX effectively in Java applications. JavaFX Programming, Part I LiveLessons is organized into lessons that teach major JavaFX features with separate sublessons that demonstrate how to apply each feature. You’ll learn how to draw JavaFX shapes and apply effects to create a richer user experience on the desktop. You’ll learn how to use layout managers with GUI controls and menus. You’ll learn how to use JavaFX properties and binding expressions to simplify event handling and reduce Java code. You’ll also learn how to create animations with JavaFX in this video. 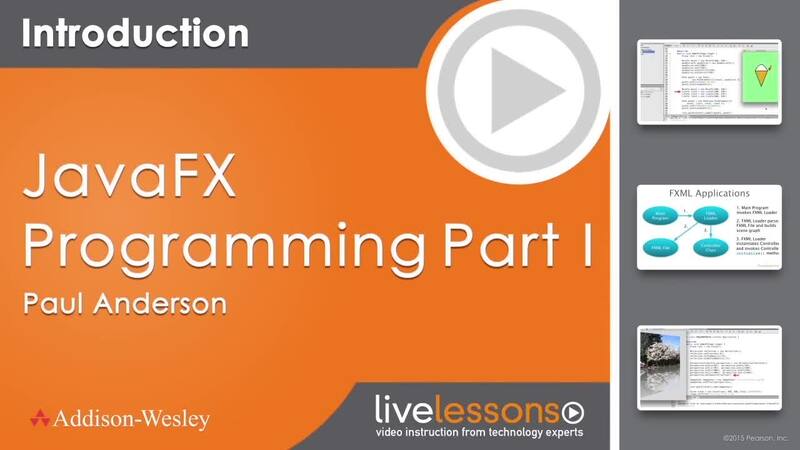 All lessons walk viewers through JavaFX code examples to reinforce the important concepts. The viewer also learns how to use the new JavaFX 8 features on the Java SE 8 platform and above. Paul L. Anderson is a founding member and Director of Training at the Anderson Software Group, Inc. (www.asgteach.com). Paul obtained his Bachelor of Arts degree from the University of California, San Diego, and his Master's degree in Electrical Engineering (MSEE) from the University of California, Santa Barbara. Mr. Anderson has taught Java, JavaFX, C++, C#, Perl, Python, UML, and Linux courses for thousands of developers and specializes in making software engineering fun and understandable. He has taught courses internationally in Europe and Latin America and contributed articles to InformIT. Paul is a member of the NetBeans Dream Team and has been a featured speaker at JavaOne conferences. He is also the co-author of 8 books on programming technologies and is the video instructor for the Java Reflection LiveLessons. Some experience programming in Java.